It might seem implausible that an avant-garde cellist could support bands like Boris, Myrkur and Mono, as well as play post-rock festivals like Dunk! and ArcTanGent, but that's exactly what Jo Quail has done. 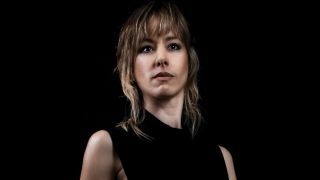 With new album Exsolve, she's cemented her reputation not only as a talented composer, but also as a master of her instrument, albeit an unconventional one, as she explains. "I use a lot of extended techniques on the cello, for example col legno, where you use the wood of the bow to hit the strings and make a percussive sound,” Quail says. “I do a lot of things very high; somebody called it, 'The arctic regions of the fingerboard,' full of rosin, you know?" Her use of an electric cello is crucial, as it allows for a greater breath of timbres and colours. "You can do [these techniques] on an acoustic cello as well... but if you start to add the most careful amount of overdrive, suddenly the sound will break, because it's not supposed to be on this instrument with all these harmonic overtones, so the result is fascinating." Exsolve was inspired by a confluence of events. Firstly, an invitation to perform at a Barbara Hepworth exhibition near Bonn. Secondly, working with a master blacksmith to forge her cello stand. "I spent a lot of time at his forge," Quail recalls. "Now, I'm not interested in making a piece of music that sounds like someone's using an anvil, but what I am interested in is the manipulation of, in his case, the metal... becoming something new." A recurring concept is that of divergent perception, and of the abstract music not only reflecting a different form of creation, but also transformation – perhaps most keenly felt in the sprawling Causleen's Wheel. "I wanted to describe the effect of – if you and I were both looking either side of a sculpture, particularly something like a Barbara Hepworth. It would be the same sculpture. I would describe it to you, and we would say two completely different things, and yet we're looking at the same work." Quail's writing process has been relatively stable across her albums. In order to maintain the ability to play the songs live, she composes with the aid of a looper to refine her ideas. When it comes to recording, these ideas are used as scratch tracks to then record the 'real' versions of the loops and musical ideas. Crucially, however, the final tracks must be performable live. "Obviously we do a lot of stuff in the studio, re-amping stuff using wizardry and trickery and dark arts to make things sound the way they do. However, when I perform them live, they sound this way as well because I spend a hell of a lot of time with my BOSS GT-100 multi-effects, and I do very silly things to the signal chain." This feeds back into Quail's extended technique: "That's how I create my percussion, and sometimes certain pieces will be built off a certain delay sound for example, because if you're a soloist and you're on your own, then delays are extremely handy, as are reverbs... that will give a real texture and depth to the sounds. If you were just playing the standard instrument, that wouldn't just be conveyed automatically, you'd probably want a string ensemble to do it."